The new legislature has not voted on any bills yet, although committees are meeting and deliberating on bills. Rather than votes this report contains some interesting or noteworthy new bill introductions. Introduced by Sen. Roger Victory (R), to prohibit parking at a designated state trailhead or state forest campground unless one has paid a state park “passport” surcharge when renewing a vehicle registration license plate tab. Referred to committee, no further action at this time. Introduced by Sen. Lana Theis (R) , to give a state Law Revision Commission the duty of reviewing whether current or proposed occupational licensure mandates use the least restrictive regulation necessary to protect consumers, as defined in the bill. Its analysis would have to apply “a rebuttable presumption that market competition and private remedies are sufficient to protect consumers,” and address whether regulations “address specific market failures.” If a current licensure mandate fails the test the commission would have to recommend that the legislature repeal it, convert it to a less restrictive regulation, or instruct the relevant officials to promulgate a revised occupational regulation. Referred to committee, no further action at this time. Introduced by Sen. Erika Geiss (D), to repeal a 1931 law that defines willfully giving a pregnant women drugs or using instruments intended to procure a miscarriage (abortion) as criminal manslaughter. Enforcement of this state statute was prohibited by the U.S. Supreme Court's 1973 Roe v. Wade decision, which held that restricting a woman's access to abortion violated a right to privacy recognized by the due process clause of the 14th amendment. Referred to committee, no further action at this time. 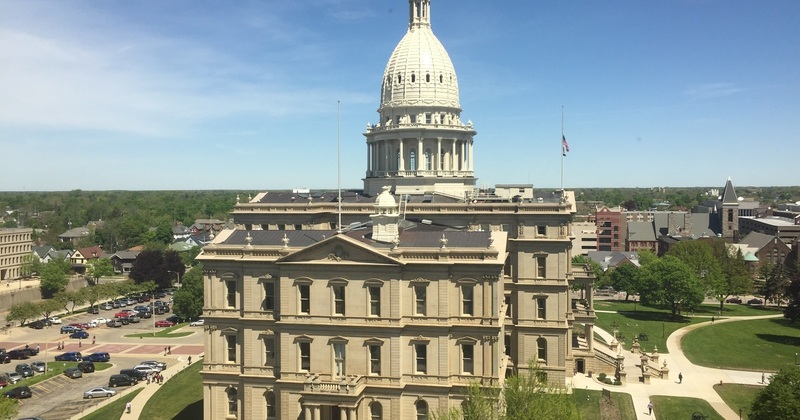 Introduced by Sen. Stephanie Chang (D), to authorize state grants to environmental organizations and other unspecified nonprofit groups, local health agencies and school districts. Actual beneficiaries would be picked by a board comprised of state officials, someone from an “environmental justice” organization, “two residents of environmental protection communities” identified by state officials and “environmental interest groups,” and local health department officials. A portion of the money would be earmarked to cover Department of Environmental Quality air pollution enforcement and mitigation. The bill does not specify how much would be spent or where the money would come from. Referred to committee, no further action at this time. Introduced by Rep. Jason Sheppard (R), to prohibit local governments from using zoning laws to prohibit property owners from renting out a home or condo for vacation or short-term rentals, which would apply to owners who use services like Airbnb. The bill would not prohibit local regulations on noise, advertising, traffic, or other conditions if these are “applied on a consistent basis to rental and owner-occupied residences.” This would apply to the rental of any single-family residence, a condo or a unit in a 1-to-4-family structure for terms of less than 28 days at a time. Referred to committee, no further action at this time. Introduced by Rep. Leslie Love (D), to designate a portion of the Lodge freeway (M-10) in Detroit as the "Aretha Franklin Memorial Highway." Referred to committee, no further action at this time. Introduced by Rep. William Sowerby (D), to extend the law makes school attendance compulsory for children age 6 and older to 5 year olds. In other words, the bill would make kindergarten attendance compulsory, subject to the same exemptions that apply to private schools and homeschooling. Referred to committee, no further action at this time. Introduced by Rep. Pamela Hornberger (R), to prohibit local governments from adopting or enforcing a policy that limits officials or police from communicating or cooperating with appropriate federal officials concerning the status of illegal aliens. The state Attorney General would have to sue if a resident filed a complaint, and local officials who enacted the policy would be liable for fines up to $7,500. House Bill 4090 would establish a similar ban for counties. Referred to committee, no further action at this time.